Según el director de la excavación Marc Waelkens es uno de los más bellos retratos del emperador encontrados hasta la fecha. Exquisitamente tallada en mármol, la estatua tendría originalmente un tamaño estimado de entre 4 ó 5 metros de altura. El descubrimiento fue hecho por los arqueólogos del Katholieke Universiteit Leuven (Bélgica), que bajo dirección de Waelkens, han estado investigando el sitio desde 1990. El pasado mes de julio, comenzó una nueva campaña de excavación, y el equipo belga retomaron el trabajo en el baño romano, centrándose en la esquina del sudeste del complejo. 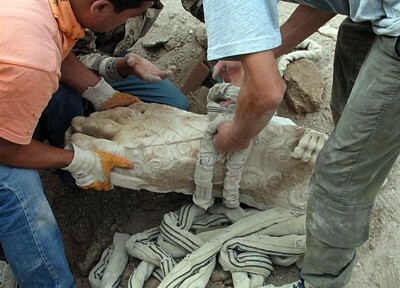 El domingo los primeros fragmentos de la estatua eran descubiertos. Un pie de 80 cm., que, por las características de la sandalia indicaban que se trataba de un emperador. Y, parte de la pierna, del tobillo a la rodilla, con un tamaño de 1,5 mts. Finalmente el lunes apareció la cabeza, que mide más de 70 cm. y se pudo identificar la imagen de Adriano, que gobernó Roma del 117 al 138 d.C.
Sagalassos fue una antigua ciudad greco-romana localizada al suroeste de la actual Turquía. Los baños donde ha aparecido la estatua fueron comenzados por Adriano, aunque terminados décadas después. La ciudad contaba con un santuario para el culto imperial dedicado a Adriano y a su sucesor Antonino Pío. 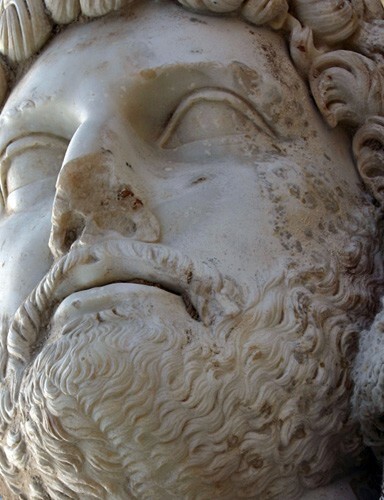 A huge, exquisitely carved marble statue of the Roman emperor Hadrian is the latest find from Sagalassos, an ancient Greco-Roman city in south-central Turkey. Archaeologists estimate that the figure was originally between 13 and 16 feet in height (four to five meters). 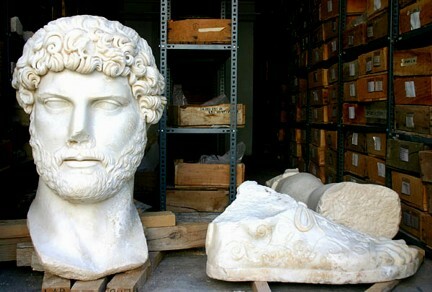 It is, says excavation director Marc Waelkens, one of the most beautiful portraits of Hadrian ever found. 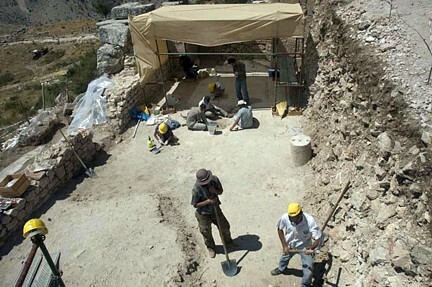 The discovery was made by archaeologists from the Katholieke Universiteit Leuven (Belgium), who, under Waelkens direction, have been investigating the site since 1990. Last month a new excavation campaign started, and the Belgians resumed work at the Roman Bath, focusing on the southeastern corner of the complex. 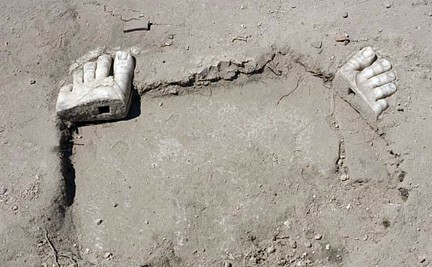 On Sunday the first fragments of a over life-size statue, a foot and part of a leg, were unearthed. The foot is 31.5 inches (0.80 meters) long; the leg, from just above the knee to the ankle, is nearly five feet (1.5 meters). 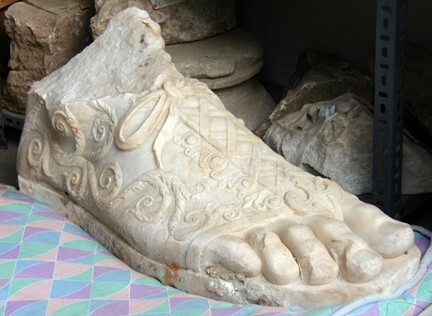 The elaborate sandal depicted on the footed indicated to the archaeologists that the fragments were from the statue of an emperor. 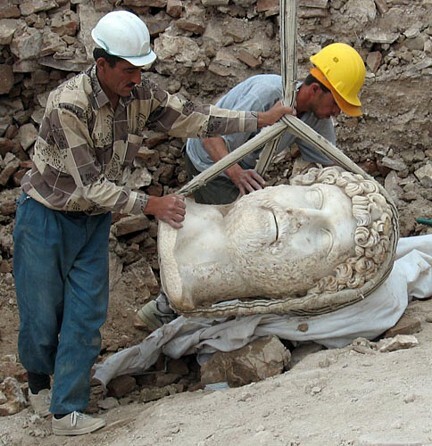 On Monday, the almost intact head of the statue was discovered, revealing that the statue was of Hadrian, who ruled from A.D. 117 to 138. The head measures more than 27 inches (0.70 meters). Construction of the bath complex in Sagalassos was started during Hadrians reign, though the building was finished only several decades later. The bath complex is one of several major building projects at Sagalassos that can be dated to the time of Hadrian and the city had a sanctuary of the imperial cult dedicated to Hadrian and his successor Antoninus Pius. The statue probably dates from the beginning of Hadrians rule. For updates on the current excavation campaign, including any additional finds related to the Hadrian statue, see the Interactive Dig, City in the Clouds. 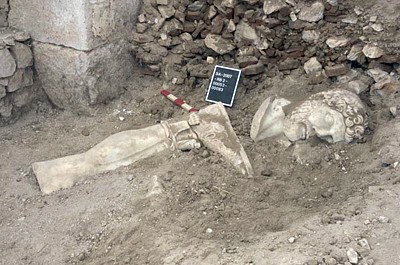 We made headlines earlier this season with our unexpected discovery of an extraordinary statue of the emperor Hadrian at the Sagalassos Roman bath. Now we can add some details to our first account of the discovery and present an initial interpretation of the find. We have also added an expanded photo gallery of the discovery. The find was made by RB2--one of two excavation teams we have at the bath complex--which is led by Christine Beckers and Willem Hantson of K.U. Leuven and Mustafa Kiremitci of Eylül Universitesi, Izmir. They were working in the southwest corner of the six-piered hall, the building's largest room (1150 sq. meters), when they found pieces of a monumental marble statue. The first elements to come to light were the lower part of a leg (from the knee to the foot) and the foot (with sandal), still touching the leg but broken off it. The length of the foot is no less than 0.80 m. Its exquisitely decorated sandal clearly identifies the person represented as an emperor shown in the "cuirassed type," wearing a military uniform. The head of the emperor (0.70 m high and with a diameter of 0.51 m) was found next to it. Clearly, the head had been carved separately and then set into the body. Traces of red paint can be seen on both the hair and sandal. 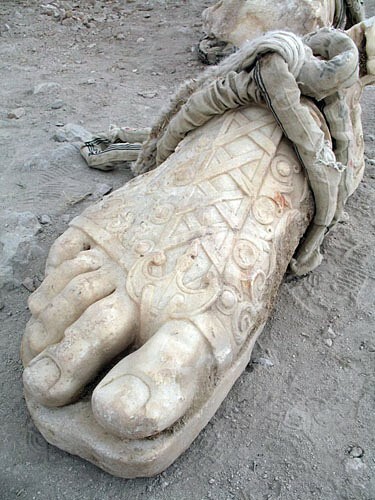 Given the dimensions of the recovered body parts, the total statue must have been nearly 5 m high. It was composed of separate elements, possibly even carved from different materials, either joined or doweled together. 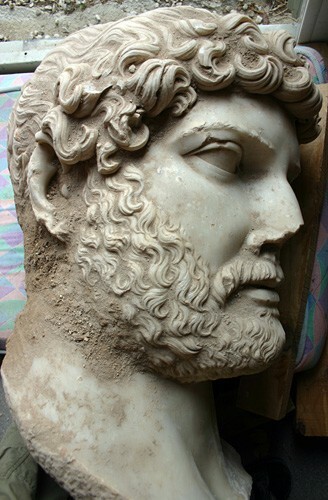 There is no doubt about the identity of the emperor the statue depicted--it's a young Hadrian (r. A.D. 117-138), who introduced the curly hair and beard of the Greek philosophers, breaking with the tradition of his clean shaven predecessors with their short haircuts. The absence of any indication of either iris or pupil is also a sign of an early date. Whereas the beard is still exclusively carved with a chisel, the drill makes its appearance in the curls of the hair. The statue is clearly inspired by one of the eight official statue types of Hadrian, in this case the Chiaramonti type (named for a portrait in the Vatican). The yellowish patina of the white marble seems to point to Dokimeion (Iscehisar near Afyon, some 350 km to the north). There can be no doubt that the sculptor as well came from one of the major sculpture workshops of Anatolia, possibly Dokimeion again. We knew already from ceramics found in the foundations that the construction of the huge Roman Bath complex at Sagalassos started under Hadrian, but this is certainly not the main reason why he was represented in colossal size in the building. Hadrian was the emperor, who shifted Sagalassos from the province of Asia, with which it had no special links, to the southern province of Lycia-Pamphylia, where Pamphylia and its ports of Attaleia, Perge, Side, and Aspendos formed a natural conduit for the city' economy and trading activities. This move must have increased the city's existing economic prosperity. Sagalassos' prosperity, however, was even more stimulated by the fact that under Hadrian, the city became the neokoros of Pisidia (the center of the region's official Imperial cult). That position was marked by construction of the large shrine dedicated to "the divine Hadrian and to Antoninus Pius." The inscription indicates that Hadrian had already died (and been deified) and succeeded by Antoninus Pius (r. A.D. 138-161) when the shrine was completed. Preference given to Sagalasos under Hadrian also explains the colossal size of structures such as the Odeion (2,000 seats? ), the Baths, and the Theater (9,000 seats), the presence of four monumental nymphaea (fountains), two agoras, and so many other impressive monuments, much too large and much too numerous for a city with certainly fewer than 5,000 urban dwellers. 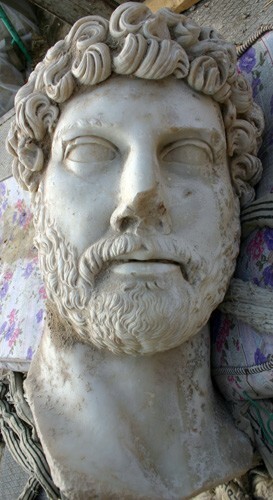 Hadrian's connection to the city was also signaled by a gilded statue of Hadrian, possibly erected in ca. A.D. 129-132, housed in the nymphaeum along the major E-W street connecting the Baths with the Apollo Klarios Temple (which at the time of the construction of the Baths still also housed the Imperial cult). These buildings offered the necessary infrastructure needed by a neokoros center, during the festivals and games that attracted thousands. Moreover Hadrian must have granted the city also a second very important title, which it carried until the time of Constantius II, that of "first city of Pisidia, friend and ally of the Romans." In light of all these events, including Hadrian's repeated visits to Pamphylia and parts of Pisidia, his colossal image placed in the largest hall of the Roman Baths has an additional meaning and explanation. 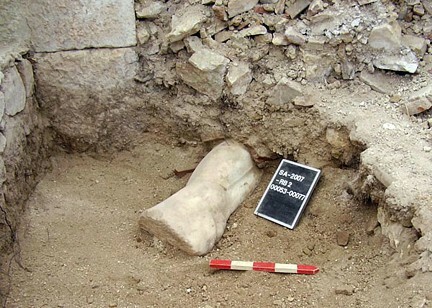 Later, during the fourth week of the excavation season, the RB2 team found two other feet fragments in the same area. These were discovered directly on the mosaic floor of the hall and consisted of the front part with the five toes and the beginning of a simple sandal. Most likely, they should be attributed to a similar colossal statue of Sabina, Hadrian's wife, who accompanied her husband on his trips in Pamphylia. Her statue and the remaining parts of that of Hadrian will hopefully be found next year. Marc Waelkens is a professor of archaeology at the Katholieke Universiteit, Leuven, Belgium, and director of the Sagalassos excavations. Hola, me encanta esta pagina. Me encanta la historia y me gustaria contactar con alguno de vosotros para que me explicaramás cosas. Me gusta mucho la historia y la arqueologia.